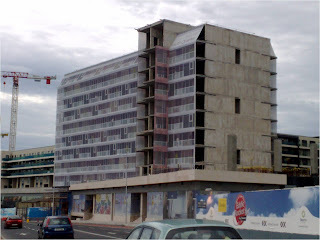 There's something slightly North Korean about the temporary coverings applied to some of the partially built apartment blocks in Sandyford, Co. Dublin (where I snapped this picture yesterday evening). Ghostly images of occupants and furniture appear several stories up what is still an unfinished building. The Sunday Independent suspects it's something sinister; though I'm inclined to accept the developer's expanation at face value, for now.